I was asked to make a jewellery box as an anniversary present in which to store and display a collection of 1930-1950 Mexican silver cufflinks and tie pins for a teacher with design qualifications who is also a garden designer. After a long discussion about possible styles, it was decided that the client would create that required for the lid, leaving me to work out the practicalities of accommodating the collection. This was a first for me, as I much prefer to agree a rough look, which then evolves during the course of the making. 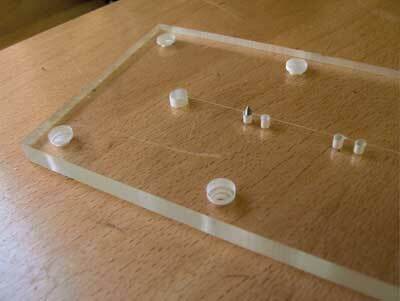 When the design arrived it was very specific, with all the positions and sizes carefully marked out to the millimetre. The stated colours indicated a potential wood-matching problem. 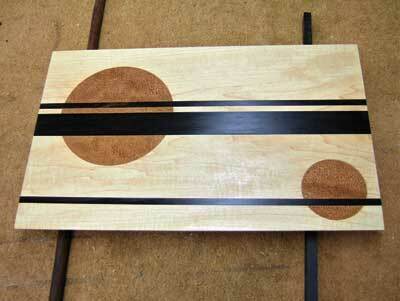 The black and white woods were easy: maple (Acer spp) and African blackwood (Dalbergia melanoxylon). The colour described as 'terracotta' was going to be a bit more testing! My initial thought was to use steamed pearwood (Pyrus communis) and this proved to be a good choice. The final finishing of all the wood needed some experimentation, with the pearwood requiring oiling to take on the necessary shade. 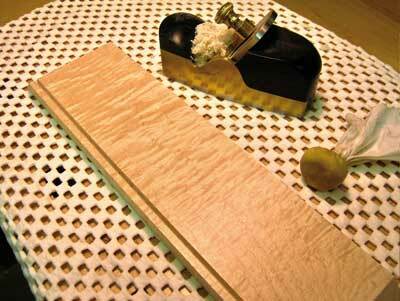 The maple, however, needed a different finish as oiling gave it a yellow hue, which would become more pronounced over time. The final choice for the maple as well as the rest of the box was three very thin coats of a carnauba wax blend, applied with a rubber and buffed up straight afterwards. 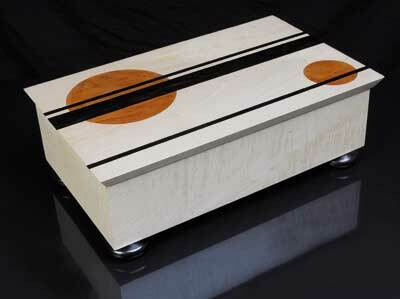 This gave a hard, very tactile surface and changed the colour of the wood very little. 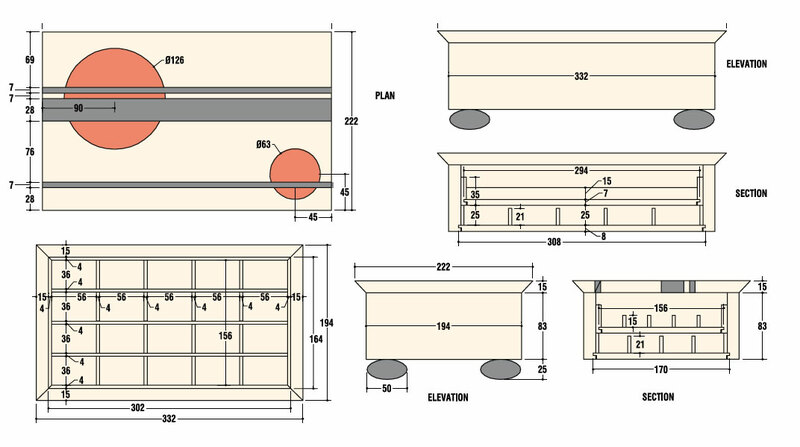 With such specific dimensions, it makes sense to build the lid first. The pearwood circles and their matching recesses are the first challenge. 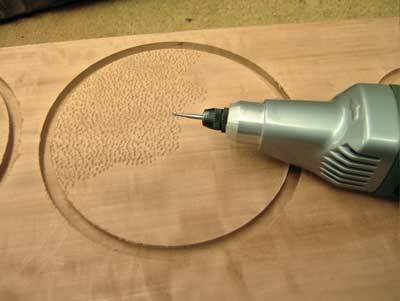 These can be cut in a number of different ways and my first choice was to use my Micro Fence circle-cutting jig with a router, but unfortunately these circles were too small. 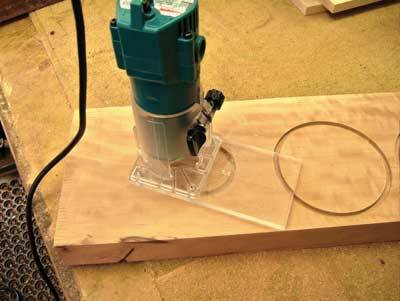 In the end I made a Perspex base plate for my very useful little laminate trimmer and drilled two holes for the centre pin exactly 5mm apart. By using a 5mm cutter and moving the pin from one hole to the other, I was able to get a nice tight fit for both circles. Before gluing in the circles, they are textured with a 1.5mm ball bit in a Proxxon grinder. 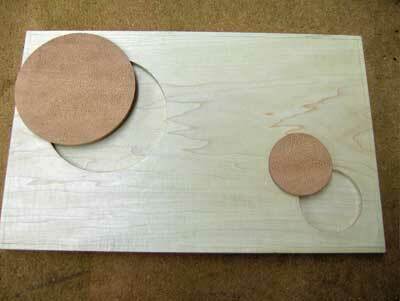 The circles are then oiled to achieve the desired terracotta colour. 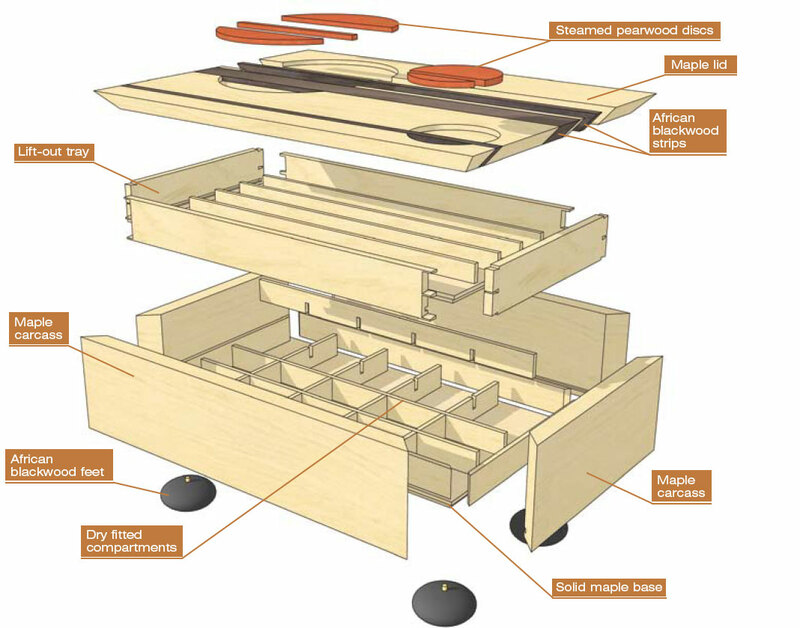 The next stage is to remove the waste to accommodate the solid African blackwood. This was done very carefully to make sure the curves of the circle lined up. The very thin strip of maple left in the middle is cut on the tablesaw after making a zero- clearance insert Any damage here would mean starting again. All parts are glued up at the same time using yellow glue. I used my granite surface plate, covered in greaseproof paper, to ensure flatness on the underside. 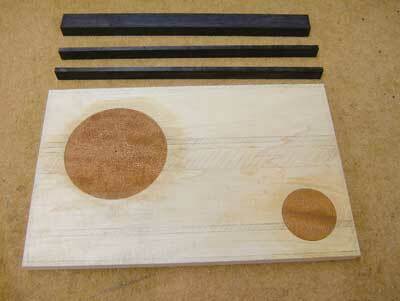 The African blackwood is cut 1mm oversized and planed down flush with a high-angled plane once the glue is dry. The pearwood circles are slightly recessed to avoid planing, and add to the contrast in textures. The box sides are mitred at 45 degrees on the tablesaw, after ensuring that the fence is exactly 90 degrees to the blade. The 4 degree angle is set using the digital level box, which is accurate to one tenth of a degree. The corners are pulled together tight using 2in masking tape and the fourth corner is checked for a perfect fit. 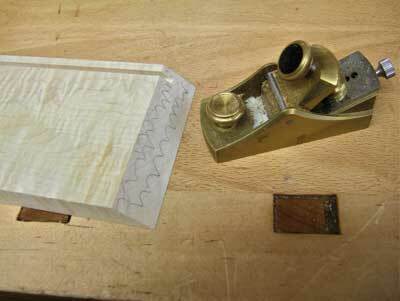 Despite my best efforts this last corner required a small adjustment with a low-angle block plane. 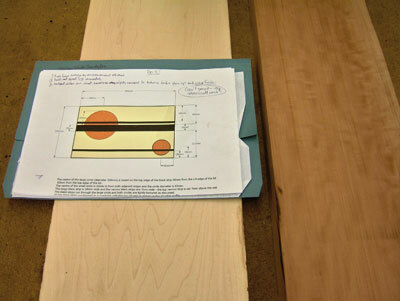 A groove is cut on all sides on the router table to receive the solid base which is rebated to give a flush finish underneath; this is necessary for attaching the feet. After planing and waxing the inside surfaces, photo 11, the box is glued up using epoxy resin and fresh masking tape. Epoxy was the only viable glue choice because I did not want to spoil the clean lines by using reinforcing keys on the corners. Should all of this effort still not give perfect results, a cabinet scraper burnisher can be carefully used to close and soften the corners. The support for the lift-out tray is made next from 4mm-thick maple strips, mitred at the corners and fitted without glue. 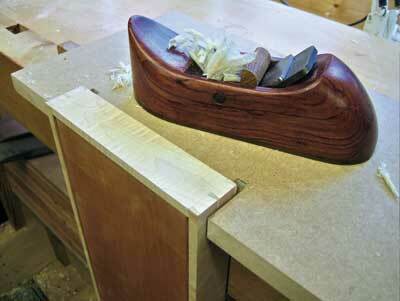 A nice tight fit is achieved with a hand plane on a shooting board with a donkeys ear block clamped on. Angle compensations can be made in both directions with folded paper as described very well by David Charlesworth in his DVD on precision shooting. 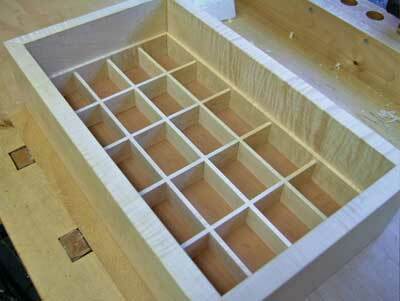 The 20 compartments in the lower tray are again all tightly dry-fitted. The pieces are all joined with half slots and gang cut on the tablesaw, with the riving knife lowered just below the blade. 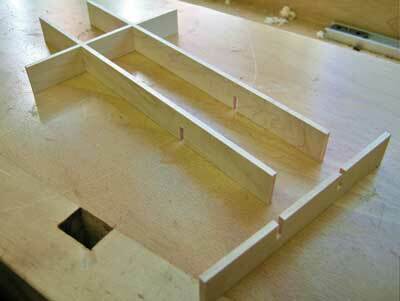 Care is needed to set up the cut at exactly the right width for tight gap-free joints. With hindsight it would have been quicker to thickness the stock to match a router bit and cut them on the router table in one pass. 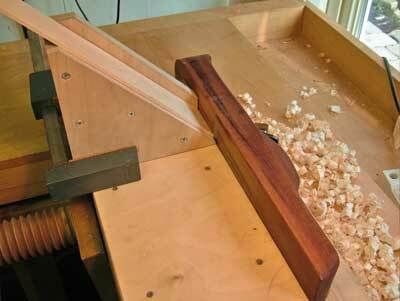 The upper tray has 7mm sides and I felt that these should be dovetailed for maximum strength. Carefully planing the tray to a close fit allows it to drop slowly down on its own, cushioned by the escaping air. Waxing all surfaces with the carnauba blend helps the smooth descent. Each of the lower 20 compartments is fitted with a piece of 2mm card covered in black dressmaking velvet, glued with latex glue. Again these are dry-fitted to a friction fit. 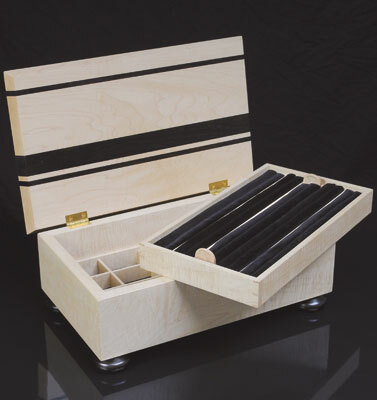 The top tray contains five full-length ring holders to take cufflinks, and is created by folding 6mm-thick foam over 2mm card and covering in black velvet. Two of these rolls are used in each section to create the slot for the cufflinks. Yet again these are dry-fitted, being tight in both length and width. 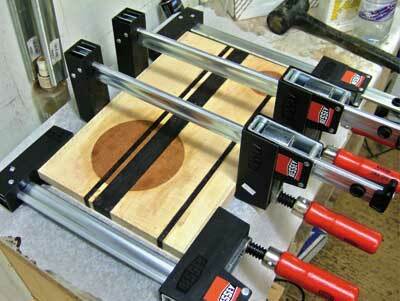 Pulls are added to the centre section, with hand-carved recesses for a better grip. 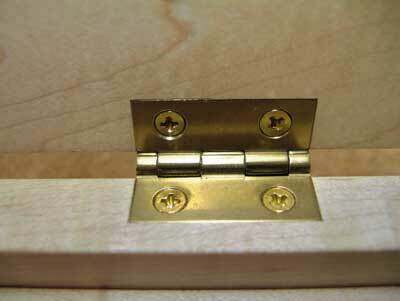 The lid is next to be fitted, using Brusso 95 degree stop hinges. 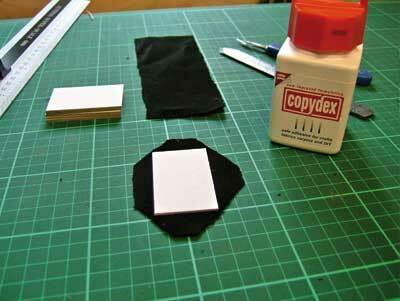 These are marked out individually with a sharp knife for a gap-free fit. The bulk of the waste is removed with the laminate trimmer and then carefully chiselled back to the knife line. The large bun feet were turned by a friend of mine from African blackwood to match the black inserts in the lid, and then glued to the flush base with 4mm brass-type dowels and epoxy resin. This was a departure from my normal process, which starts with the wood rather than a drawing board. However, the balance of the design and colours, as well as the proportion, worked very well and was a pleasant surprise. "When the design arrived it was very specific"